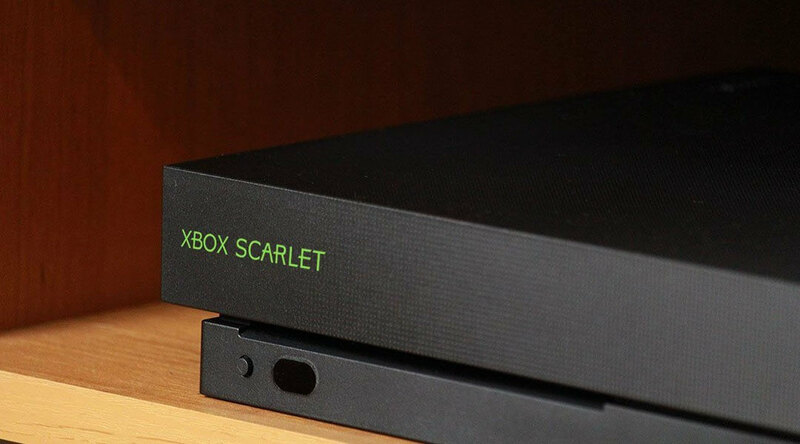 Thurrott.com reports that the new Xbox will be part of a family codenamed Scarlet—a name Spencer revealed in June. The first console will be a natural successor to the current Xbox One lineup. There’s no word on the kind of specs we might see, but it’s expected to launch in 2020, beating rival Sony’s next-gen console to market. The second machine will be a lot cheaper, less powerful, and stream games from the cloud. The main issue people have with game streaming is the latency, which can be a problem when you’re playing a first-person shooter, but Microsoft thinks it has a solution. The Scarlett Cloud box will feature some local processing power, allowing it to perform specific game tasks such as controller input, image processing, and collision detection. This is achieved by splitting the game into two portions, which some have referred to as a slice or splice, with one running on the cloud while the other runs on the console. Its internal hardware will make the Cloud box more expensive than a standard streaming device, but it will still be cheaper than a regular Xbox. It will also require a subscription, which is how Microsoft is expected to generate revenue, and it's been noted that no games will be exclusive to the standard console. The streaming box is also set to launch in 2020. It’ll be interesting to see how consumers react to a dedicated streaming box. Game streaming has yet to become the revolution we were once promised, but more companies are turning to the technology, and some industry insiders believe it to be the future of the gaming industry. It'll cost less but require a subscription to play games and the experience is completely dictated by your Internet Connection. No Thanks. VBKing and Reehahs like this. I think that the success of a streaming box will mostly be determined by prices. People are already used to paying for subs for digital video and dealing with tech issues, and Xbox users are used to paying a sub for online play, and many are familiar with Xbox Games Pass (though I've seen no details of number of subscribers). penn919 and Reehahs like this. Honestly, it would serve thier interests to open the service to as many devices as possible xbox, pc, mac, linux, android, chome os, fire tv, switch, hell I'd even put it on playstation if I could trick sony into allowing it. I think for the streaming only version at a lower price is only going to justify having a higher markup of their full version Xbox. I personally think this thing could be great for swinging over Sony gamers to play some exclusive titles while also collecting that steady subscription revenue. This highly depends on how Microsoft sees its interests. It looks to me like Microsoft is still interested in pushing Windows 10, so offering the service on that makes the most sense. It's not out of the question that if the service really takes off it will make it to other platforms, but I don't think it makes sense for Microsoft to start with that. That's an idea, but I doubt the streaming service would be enough to entice anyone to move to windows 10 if they already don't like it. Perhaps not (though I think for some it might), but I think that for Windows 10 users it will help bring gamers into Microsoft's walled garden. In the end, I think that the consolidation of Windows 10 (S) and Xbox makes sense, allowing people to migrate to Microsoft produced hardware over time. Having the service available on all platforms will make nudging people in this direction harder.